From Purees to Carrot Sticks - When is Baby Ready for New Foods? From Purees to Carrot Sticks – When is Baby Ready for New Foods? When your baby meets new gross motor milestones (like sitting up, crawling, or walking) that’s your cue to introduce new types of food. Why? Because your baby’s oral motor skills (like biting, chewing, and swallowing) mimic his gross motor skills. When he’s ready to do something new with his body, he’s also ready to do something new with his mouth! 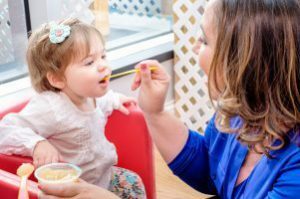 Why is it important to introduce solid foods at the right times? Introducing solid foods either too early or too late can lead to food aversions, obesity, diabetes, and allergies. Also, speech is tied to oral motor development, so giving your baby food he’s not ready for or delaying food he is ready for can interfere with his speech development. By introducing foods at the right times, you can avoid these problems and set your baby up for a lifetime of healthy eating. Below we look at three gross motor milestones and how you can set your baby up for feeding and speech success! Unless your baby has a medical issue (like reflux), we say stick with breast milk, formula, or a combination of the two until your baby can hold his head up and sit with little to no support. All babies are different, but this usually occurs around 6 months. As your baby gains head control and the ability to sit up, his larynx (voice box) lowers, his cheeks thin out, and his body becomes stronger and more mobile. This leads to the jaw stability and tongue movement required to eat purees from a spoon. The developments involved in sitting and eating purees prepare your baby to babble. Your baby will start making lip sounds like “ba-ba” and “ma-ma”, and then tongue sounds like“da-da”. Crawling brings in left-right movements, which are also is happening with your baby’s jaw, tongue and lips. When he begins crawling, he is ready for soft foods that he can bite and chew, like pieces of cooked vegetables, soft fruits, or pasta. The coordination required for crawling, biting, and chewing lead your baby to make more complex speech sounds. Babbling will now have different combinations of sounds (da-gee-da). Walking brings in increased rotary movements (up-down, left-right, and side-to-side). This leads to a more controlled ability to bite and chew, and your baby can now start to handle a variety of textures. Try harder vegetables, cubed fruits, cheese, and soft meats. The jaw, tongue and lip coordination involved in walking, and biting and chewing harder foods, leads to more complex speech. Jargon will emerge (making sounds that imitate adult speech) and soon your baby will say his first true words. By following your baby’s gross motor development to introduce different types of solid foods, you can ensure that he is ready to move on from simpler textures and handle more complex ones. This will nurture normal speech development and set your baby up for lifelong healthy eating habits. For extra tips about encouraging healthy eating habits, stay tuned for an upcoming article about The Pros of Messy Eating!